The A Series goes beyond great by skillfully utilizing rich, luscious African Blackwood to accentuate the subtle curves and elegant silhouette of the knife. Form and function seamless blend together to create a knife both beautiful and practical, a knife that performs perfectly and looks amazing. 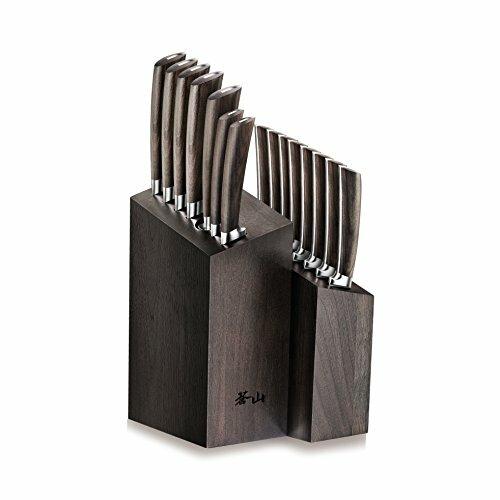 Rich, deep walnut wood adds to the luscious beauty of the luxurious asymmetrical A Series Knife Block, showcasing the natural, organic beauty of wood and metal. Patent Pending Design knives that focuses on ergonomics handle made of African Blackwood, one of the hardest wood in the world. Extra fine diamond coated honing steel included, which is tailor-made for A Series.